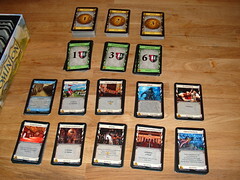 This review is based on the German version of Dominion published by Hans im Glück. 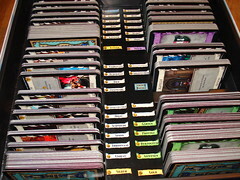 When I was a good deal younger than I am now, I had a short, intensive and expensive fascination with Collectible Card Games. After spending more money than I should have on cards, never getting those all-powerful rare cards in my booster packs, I realized: I liked the game mechanics of those games, I also liked the deck-building aspect of them, but I hated the fact that I could easily be outclassed by another player just because he was spending more money. Maybe Donald X. Vaccarino – what the X. is for remains a mystery for now – had the same thoughts when he designed Dominion, because he used the fun parts of CCGs, but removed the evil need-to-spend-more-money aspect. So, what is this Dominion, and how is it different from collectible card games? First of all, it’s not collectible.When you open the box, you find all the cards to play Dominion with up to four people. You get big piles the “boring” cards – money and victory points – and you get smaller stacks of the “fun” cards. The fun cards are all kinds of action cards that allow you to do stuff. What stuff? We’ll get to that in a second. You’ll start the game with 3 Estates worth one victory point each and 7 Copper in your deck. Shuffle well. Get used to the shuffling, you’ll be doing that quite a bit. Those cards are your starting draw pile. You draw 5 of those cards to make up your hand for that turn. A turn in Dominion is, basically, very short. You do one Action, then you do one Buy, both steps are optional. Afterwards you put all the cards you just played AND all the cards left in your hand to your discard pile and draw 5 new cards. If at any point you need to draw cards and your draw pile is empty, you shuffle the discard pile. Remember: you start with 10 cards in your deck, one basic hand is 5 cards. I told you to get used to the shuffling. Since you start the game with no action cards in your deck, your first 2 turns will be even shorter. All you can do is Buy one new card. Buying a card is easy: every card has a value that is printed in the lower left corner, ranging from 0 to 8 coins in the basic game. You discard that many coins and take the card- each Copper is worth 1 coin, Silver is 2 and Gold is 3. The new card goes to your discard pile, so you will only get to play with it after the first shuffle. In most games, you will have 2 action cards in your deck after the first shuffle, so now you can make use of the user phase of your turn: Action! +n Card(s): you draw that many more cards from your draw pile into your hand. If your draw pile is empty, you may now shuffle your discard pile. If your discard pile is also empty – rare, but it can happen – tough luck, no more cards. +n Action(s): you can perform n additional actions this turn. Cards that give you +1 Action will always have another effect, or they would be pretty pointless. Cards that give you more actions make it possible for you build some impressively long moves. +n Buy(s): after taking your actions, you may buy n additional new cards on this turn. Of course you have to pay for them, or you can always take Copper with your spare buys, because Copper is just lying in the street waiting to be picked up. It’s free. +n Coin(s): you can use n additional coins to buy cards on this turn. You don’t take money cards for these, you just add the number to the money cards from your hand. Chapel: Trash up to 4 cards from your hand. Trashing a card means completely removing it from the game. This is a relatively cheap card for only 2 coins, and you will probably be wondering the first time it’s in your game what exactly it is good for. There is very viable strategies starting with the chapel though, and if you’re not going for that, it can still get rid of those pesky Curse cards other players can force you to take. Workshop: Gain a card costing up to 4. A bit more straightforward to use than the chapel. When you play the Workshop, you take a card costing up to 4 coins to your discard pile without having to pay for it. Also, this does not count as a Buy, so you can still buy another card on the same turn. Witch: + 2 Cards. Every other player gains a Curse card. The Witch is labeled as an attack card, meaning it does something unpleasant to your fellow players. In this case, something unpleasant means giving them a Curse card that is worth -1 Victory Point and – even more unpleasant – will show up in their hand again and again instead of a more useful card. Going through all the possible cards would make this a long and boring read, and it’s really not necessary, because in addition to the manual the Dominion box contains another booklet explaining all the cards in more detail and clearing up some ambiguous situations. I just want to mention 2 more cards here, because they are a bit more special. Moat: +2 Cards. When another player plays an Attack card, you may reveal this from your hand. If you do, you are unaffected by the Attack. This one is set apart from all the other cards by the blue border. It’s the only Reaction card in the basic game and makes you immune to attacks from the friendly people around your game table. Keep in mind that you only have to reveal the card, not discard it. So if you draw it at the end of your turn, you are protected from all attacks until it’s your turn again. And then you can still use it to draw 2 cards. Garden: Worth 1 Victory Point for every 10 cards in your deck (rounded down). The Garden is not really an action card, it doesn’t do anything. It is an additional Victory Card, so all it does is give you more points at the end of the game. If you commit to a strategy based on Garden early in the game and make sure to collect all the cards you can get, Garden can be a very powerful card. Just don’t rely on any combination of cards to show up in your hand, because in order to make Garden worthwhile, you’ll clutter up your deck in the most terrible way with cheap cards like Copper and Estate. Going through all your cards in one turn is great fun, but if you can't buy anything at the end, it doesn't make you win. At least this one stole some moneys. Buy some action cards. Make up your mind which cards will work together well and concentrate mainly on those. In this stage, your building your little engine that will churn out gold for you. Don’t rely on overly complex combinations of cards, the more cards your strategy needs, the less likely you are to draw them all at the same time. Get rich. Let your little card engine pucker away and make money for you. Sometimes you will buy Gold directly, sometimes you need to get Silver first in order to afford it. Collect Victory Cards. It’s an important decision when to start doing this. Do it too late and someone else will grab all the points away from you. Start too early and the victory cards will slow down your game. Since they show up in your hand like any other card, but have no benefit at all, having a too big amount of victory cards in your deck can leave you with hands that cannot do anything. This outline may be the most common, but it’s by no means mandatory. Depending on which cards are in the game, everything can change. It’s also important to keep in mind that there is 2 ways to end the game: either someone buys the last Province or the third stack of cards is used up. This second option is more common in 4-player games than in 2 players, but it’s always good to keep an eye on that, or your opponent may just end the game after getting a small point lead by getting a few cheap cards. Obviously, not all cards are equally useful in giving you an edge. This is mostly reflected by their price, the more expensive cards are generally more powerful. There is a small variance depending on which other cards are in the game and the number of players. 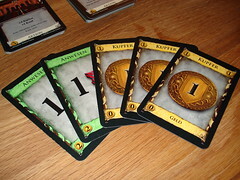 The Thief, for example, is vastly more powerful in a 4-player game since there is a much higher chance of winning big money. 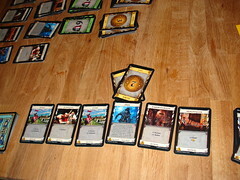 From the first game, Dominion has become a favorite for everyone involved in out test games. It’s a very easy game to get into, the mechanics are easy and straightforward. It still offers a lot of depth, and the different sets of card in each game make every game somewhat different from the last. Each game will have a slightly different pace, and while some games will be peaceful kingdom building exercises, others can become much more warlike with the right set of attack cards. No matter which set of cards, it’s a very satisfying experience to build up your deck and then see how it does against the other’s efforts. Although the author denied in interviews that this part of the game was inspired by CCGs, I still find it remarkably similar, only that here it is part of every game to build up your deck. And you know what you can get in advance. And you can still afford food afterwards. The game is quick enough to try out what happens if you just add this other card to your deck instead of that one, and you may not be happy till you bought and used each card at least one, just to see it in action. And sometimes, discussing which cards to use can be half the fun already (“I won’t play if there is no village!”). The box inlay is pure genius.Not having to sort through a few hundred cards before starting the game is awesome, and it looks pretty cool, too. Give that man a Nobel! The cards mostly have atmospheric artwork to go with them, and while the theme does not always match the mechanics – why does a Throne Room make you execute another action card twice, thematically? – this never breaks the fun of the game. Also, the designer of the box inlay that keeps the cards ordered should be awarded some kind of medal, because the game really would not be fun if you had to sort the cards first every time. The game also finds remarkably little rejection in people that are not generally non-gamers. Out of all the people we tricked into playing with us so far, there was some that did not fall in love with the game, but there was not a single one that hated it and never wanted to play again. Still, there is one small caveat in the end that you should be aware of: Dominion is not Diplomacy by a long shot. There is little interaction between the players, even with the attack cards. There is no forging alliances, no haggling about trades. It’s playing your game, and just occasionally stepping on someone else’s feet. Other than that little detail, Dominion gets an all-out recommendation from us, it’s fun with any number of players, with casual and more involved gamers alike. The many different possible card setups make it fun even after many games played, and if that is not enough there is already 2 expansions available with 2 more in the making – all of which we did not have the opportunity to try out yet, but the general consensus on the interwires seems to be that both available ones add to the game without destroying the simplicity of it.